When people talk or write about the early Chevrolet Corvette, they usually refer to the 1953 model. The fact is that 1953 production was almost nonexistent as far as the general public was concerned. The Chevrolet Corvette debuted as a one-off concept car at the 1953 GM Motorama, which kicked-off in February in New York City. There was such great interest in the little roadster that Chevrolet decided to put it into production. After a lot of last-minute rushing, the first Corvette rolled off a makeshift assembly line in Flint, Michigan on the very last day of June 1953. Only 300 1953 models were made - all were finished in Polo White with a black fabric top and red interior. Nearly all 1953 production was allocated to VIPs - General Motors execs, DuPont family members, movie legend John Wayne and NBC's 'Today' host Dave Garroway, who starred in the first Corvette promotional film. In the ad, Garroway noted - with a straight face - that the automatic shifter is put on the floor "in keeping with sports car tradition." 1954 was the year that Corvette went into full production at its St. Louis plant, which had a capacity of 10,000 cars per year. For $3,523, buyers got a sleek looking, low-slung car with side curtains and no outside door handles. New exterior colors were offered in '54: Pennant Blue, Sportsman Red, and black. Despite this variety, almost 90% of the '54 Corvettes were painted white; only four black ones were produced. A new top color - beige - was offered. The 1954 vehicles had slightly longer tail pipes. Otherwise, the 1954 models were unchanged from the '53s and shared the prior year's characteristic screened headlights, pod taillights and 102 inch wheelbase. These early Corvettes were powered by Chevrolet's venerable Blue Flame Six (rated at 150 horses); power was transmitted through Chevy's anemic two-speed Powerglide automatic transmission. 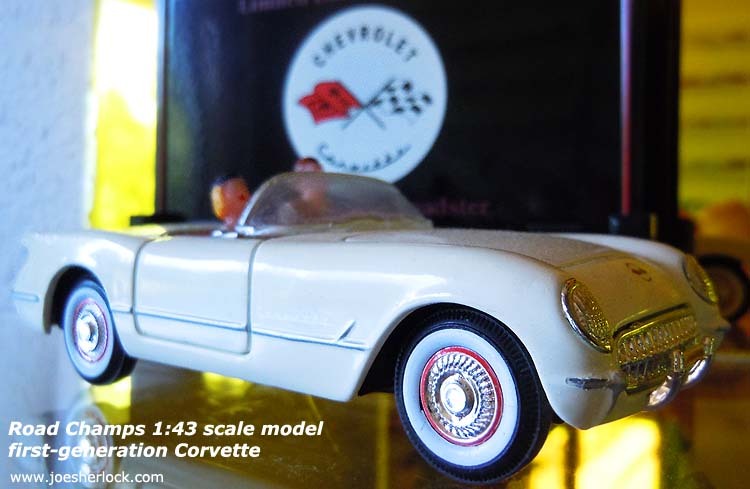 The Corvette rode on ordinary 6:70x15 tires, the same size as the ones on my dad's 1956 Ford Mainline. The Corvette managed to combine the low-power and mushy ride of a boulevard cruiser with the primitive amenities (side curtains, leaky top, etc.) of a sports car. It cost almost as much as a Cadillac that featured a V8 engine, a top that did not leak and far more amenities. A Jaguar XK120 was priced at the same level as the Vette but - with 180 horsepower and a four-speed manual transmission - would run circles around it in acceleration and handling. Prospective buyers were confused and stayed away. 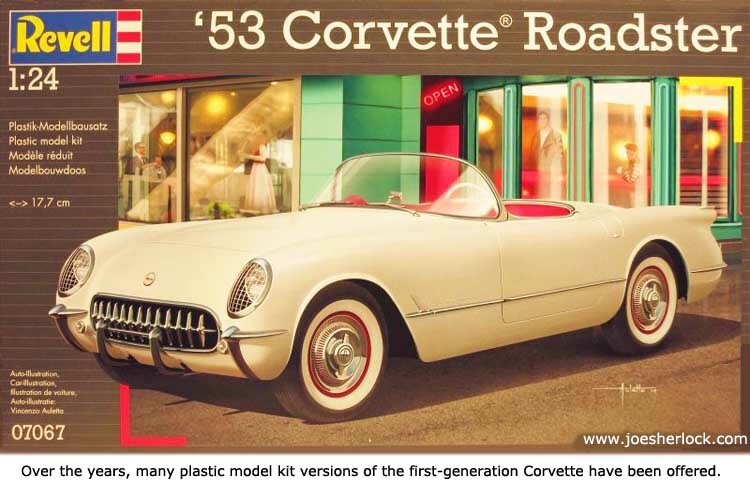 For the '54 model year, 3,640 Corvettes were produced. 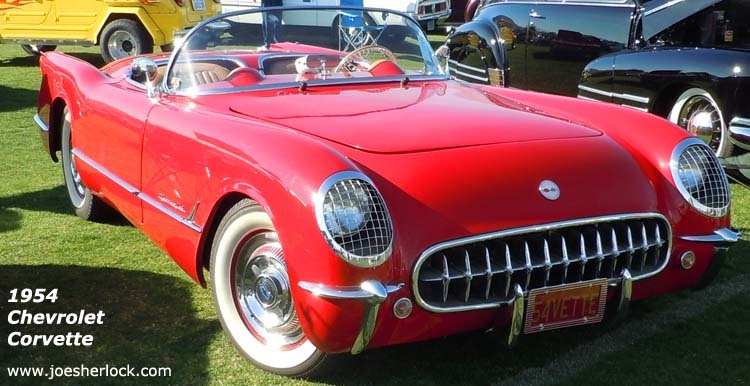 It has been reported that, at the end of the model year run, one-third of all 1954 Vettes were unsold. Corvettes would become more interesting to prospects when there were more powertrain options and other refinements. Soon Zora Arkus-Duntov arrived at General Motors and started turning the Corvette into a performance car. He helped to introduce the new small-block Chevy V8 engine to the Corvette in 1955, providing the car with the much needed power. A three-speed manual transmission was offered late in the '55 model year. Arkus-Duntov took a Corvette to Daytona Beach that same year and hit a record setting 150 mph over the flying mile. Later, this General Motors driver/engineer developed the famous Duntov high-lift camshaft and helped bring fuel injection to the Corvette in 1957. And a four-speed gearbox. Wind-up windows (even a power window option) would appear in the 1956 model as well as a power convertible top and a removable hardtop. The Corvette's fiberglass bodies were produced by Molded Fiber Glass Company of Ashtabula, Ohio - a firm had been founded by Robert S. Morrison in 1948. Morrison was a pioneer in the application of fiberglass-reinforced polyester panels to car bodies, and made many contributions to the development of producing such parts in matched-metal molds. 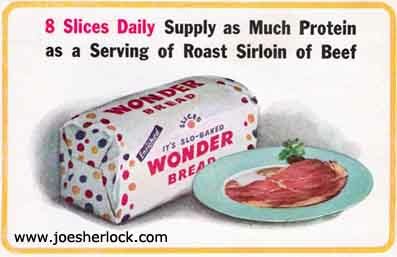 General Motors selected him as its Corvette body supplier because his was one of the few fiberglass firms producing large size fully-molded parts; MFG supplied big one-piece bread trays for Wonder Bread's delivery trucks. Maybe all those Polo White Corvettes were some kind of tribute to its Wonder Bread origins. In 1954, a polio vaccine was developed; children in Pittsburgh were received the first shots. A U.S. atomic test on Bikini Atoll in the Pacific went awry, producing a far stronger blast than expected. Prevailing winds spread radiation afar exposing many. One Japanese fisherman died. Further west, the French surrendered Dien Bien Phu in Vietnam. The Army-McCarthy hearings began and were carried live on TV by ABC and DuMont. In September, Hurricane Hazel, the most severe storm in North American history, killed an estimated 600 to 1,200 people including 95 in the U.S. The B-52 flew for the first time. The first nuclear submarine, the USS Nautilus, was launched. In auto news, Nash-Kelvinator Corp. and Hudson Motor Car Co. merged to form American Motors. Studebaker and Packard also merged. Ford debuted its Y-block engine, its first overhead-valve V-8 for passenger automobiles. First offered on a few specialty, limited-production vehicles, in 1954 General Motors offered panoramic wraparound windshields on many of its models, including all Cadillacs, Buicks and Oldsmobiles. Plymouths could now be had a with an optional two-speed Powerflite automatic transmission. Ford offered a Skyliner model with a green-tinted transparent Plexiglas roof panel; a corresponding Mercury Sun Valley also debuted as a '54 model. Initial production of the formed acrylic roof panels was carried out by Regal Plastics of Kansas City, MO. Regular gas was priced at less than 30¢ per gallon in 1954. New products included M&M Peanuts, Con-Tact Paper, Sports Illustrated magazine, chlorpromazine (the first antipsychotic drug) and Muzak. Little Matchbox cars arrived in America; they had been introduced in England the previous year. Priced at 25¢ and packaged in distinctive little boxes, the upstart faced tough competition from traditional 10¢ diecasts from Tootsietoy, Midgetoy and Goodee. But the detailing on the little Matchboxes won America over and the brand became a '50s and '60 mainstay in the toy field. Polypropylene plastic was invented in 1954. The same year, Bell Telephone Labs developed a solar battery. Swanson TV dinners debuted - frozen, assembly-line-prepared, mostly tasteless dinners in compartmentalized aluminum trays. Heat and eat. Quickly. The first Shakey's Pizza Parlor opened in Sacramento, CA. Comic strip 'Hi & Lois' debuted in '54; so did 'Marmaduke'. New words included desegregation, do-it-yourself, dragster, fallout and sci-fi. New songs for 1954: 'Shake, Rattle & Roll' (Bill Haley and His Comets), Rosemary Clooney's 'Hey There', 'Stranger In Paradise' (Tony Bennett), 'Mr. Sandman' (The Chordettes), Perry Como's 'Wanted' and 'Oh Mein Papa' (Eddie Fisher). The first Newport Jazz Festival was held. Top '54 movies: 'The Caine Mutiny', 'The Glenn Miller Story', 'On the Waterfront', Alfred Hitchcock's 'Rear Window', horror classic 'Them! ', '20,000 Leagues Under The Sea' and 'Dial 'M' For Murder'. Movie star Marilyn Monroe married baseball legend Joe DiMaggio in January. In 1954, a movie ticket cost 55¢. New television shows included 'The Adventures of Rin Tin Tin', 'Lassie' and 'Father Knows Best'. 'The 'Miss America Pageant' was televised for the first time in '54. Ronald Reagan began hosting 'General Electric Theater', now in its second television season. In 1954, a classic, well-remembered live commercial blooper caught everyone's attention when spokesmodel June Graham was unable to open the door of a Westinghouse refrigerator to show how its interior features. Deaths included quintuplet Emilie Dionne, Jacques Brandenberger (he invented cellophane in 1908), Samuel Crumbine (inventor of the flyswatter), actor Lionel Barrymore and football legend Glenn 'Pops' Warner. The New York Giants win the World Series defeating the Cleveland Indians 4-0. Drawing and text copyright 1997, 2012 Joseph M. Sherlock. All rights reserved.